For the past twenty years, Andrew Normansell has made his living performing Magic for some of the most prestigious companies both in the UK, abroad and is a regular on the UK comedy club circuit, one of the most demanding arenas for any performer.Now for the very first time, Andrew reveals some of his best kept secrets along with the routines and visual gags that have been staples in his repertoire and have ensured his clients keep coming back for more. Usually armed with little more than a deck of cards and a smile, this man will entertain and fool you badly at the same time. Whether up on stage or performing mix and mingle at a cocktail party, Andy is always guaranteed to astound and entertain. If you're looking for a video packed with impractical, knuckle busting routines that you will NEVER perform in the real world, then this video is not for you. 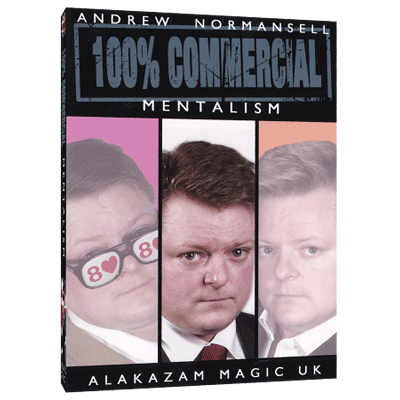 If however, you want to learn some great Magic that is 100& commercial then keep reading! On this volume Andrew shares with you the following routines: MockA streamlined application and presentation of a Max Maven idea, made easy with no risk or fishing to achieve a mind-boggling result. You simply cannot fail! Dr XOne of the most direct and unbelievable openers ever conceived! A number of jumbo cards are displayed It is explained that they have been selected for psychological reasons. The spectator names any one of them and it is the only one that is marked on the back! Absolutely incredible and 100% practical. Double DeckerA stunning presentation piece, demonstrating super-power memory plus the revelation of a card simply THOUGHT OF by a spectator! The Janus GamePacks small and plays big! A deck of card is distributed amongst the audience, where they are thoroughly mixed and then are randomly turned face up and facedown, culminating in an astounding prediction. Rising SunAn experiment in creative visualization. A spectator is asked to imagine a country and the performer divines the mentally selected destination. DoodlebugThis has to be the ultimate! The most perfect drawing duplication ever! The performer and a spectator stand back to back and at the same time draw a design and you've guessed it...they both match! No forces. No ifs! No buts! This item alone is well worth the price of the video. High FiveA stunning hands-off direct mind reading item. The spectator thinks of a randomly selected card with the deck in their own hands, yet the performer instantly reveals the card. Uses any regular deck! The performer's back is turned as the card is selected! The deck is also thoroughly shuffled! Diabolical ProphesyAn unfathomable prediction that you will not believe! Perfect for close up, cabaret or stage. Devil's TriangleCoincidence? Influence? Or Telekinesis? You decide!